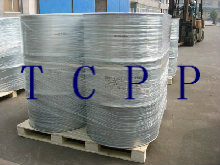 Tris2-chloropropyl phosphate MSDS - ZhangJia Gang YaRui Chemical Co., Ltd. This chemical is stable under normal laboratory conditions. The flash point for this compound is ＞93 C; It is probably combustible. Fires involving this material can be controlled with a dry chemical, carbon dioxide, or Halon extinguisher. This chemical may hydrolyze under acidic or alkaline conditions. When heated to decomposition this chemical emits very toxic fumes. Where the neat test chemical is weighed and diluted, wear a NIOSH-approved half face respirator equipped with an organic vapor/acid gas cartridge (specific for organic vapors, HCL, acid gas and SO2) with a dust/mist filter. You should store this material in a refrigerator. STORE AWAY FROM SOURCES OF IGNITION. If you spill this chemical, FIRST REMOVE ALL SOURCES OF IGNITION. Then, use absorbent paper to pick up all liquid spill material. Your contaminated clothing and absorbent paper should be sealedin a vapor-tight plastic bag for eventual diposal. Solvent wahs all contaminated surfaces with ethanol followed by washing with a soap and water solution. Do not reenter the contaminated area until the Safety Officer(or other responsible person) has verified that the area has been properly cleaned. Disposal and Waste Treatment: Not Available. Recommended Glove Materials: Not Available. IMMEDIATELY flood affected skin with water while removing and isolating all contaminated clothing. Gently wash all affected skin areas thoroughly with soap and water. If symptoms such as redness or irritation develop. IMMEDIATELY call a physician and be prepared to transport the victim to a hospital for treatment. IMMEDIATELY leave the contaminated area; take deep breaths of fresh air. If symptoms (such as wheezing, coughing, shortness of breath, or burning in the mouth, trroat, or chest) develop, call a physician and be prepared to transport the victim to a hospital. Provide proper respiratory protection to rescuers entering an unknown atmosphere. Whenever possible, self-contained Breathing Apparatus should be used; if not available, use a level of protection greater than or equal to that advised under respirator recommendation. First check the victim for contact lenses and remove if present. Flush victim’s eyes with water or normal saline solution for 20 to 30 minutes while simultaneously calling a hospital or poison control center. Do not put any ointments, oils, or medication in the victim’s eyes without specific instructions from a physician. IMMEDIATELY transport the victim after flushing eyes to a hospital even if no symptoms (such as redness or irritation) develop. DO NOT INDUCE VOMITING. If the victim is conscious and not convulsing, give 1 or 2 glasses of water to dilute the chemical and IMMEDIATELY call a hospital or poison control center. Be prepared to transport the victim to a hospital if advised by a physician. If the vitim is convulsing or unconscious. Do not give anything by mouth. Ensure that the victim’s airway is open and lay the victim on his/her side with the head lower than the body. DO NOT INDUCE VOMITING. IMMEDIATELY transport the victim to a hospital. Information concerning symptoms of exposure to this chemical is not available. Status: Reported in EPA TSCA inventory, 1983. Appearance: Clear, clolrless viscous liquid. Not subject to the German Regulation on Flammable Liquids (VbF). This substance is not subject to IMO IMDG Code. TSCA (Toxic Substances Control Act): Substance is listed. Sax Toxicity Evaluation: THR: HIGH intravenous. If Tris2-chloropropyl phosphate MSDS product is not what you want, we can be customized according to your needs, please send us your order to Email: sales@yaruichem.com , or click here to post your buying lead.